Maine Gov. Paul LePage called the Washington Post "fake news" regarding a report that President Trump is planning to push him to run against Sen. Angus King. Calling it "fake news" and "vile," Maine Gov. 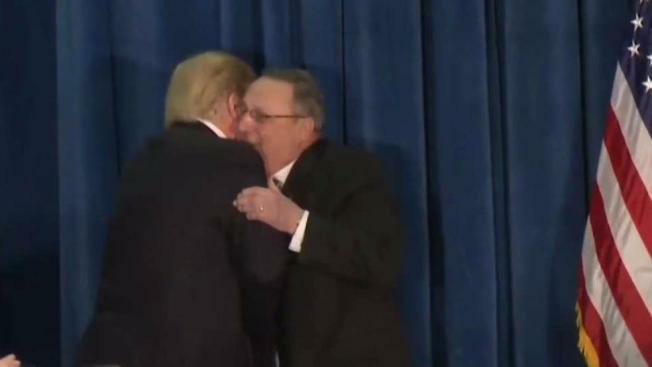 Paul LePage is refuting a report that said President Donald Trump is urging him to run for the U.S. Senate, saying he's decided to not campaign. Two anonymous sources told the Washington Post that Trump has said he plans to call LePage to ask him to run against Sen. Angus King in 2018 while offering his endorsement. LePage's name has reportedly come up as the White House discusses the 2018 midterm races in various states. However, LePage refuted the Post's report on Thursday, calling it "fake news." King, a former Maine governor himself, is an independent who usually caucuses with Democrats. LePage has stirred controversies in the past, including when he left threatening comments on a lawmaker's voicemail, said he often makes up stories to mislead the press and said 90 percent of drugs dealers in Maine were black and Hispanic when a FOIA request showed the opposite. The Post also reports White House officials said LePage happens to be a favorite of Trump's, including asking about him unprompted or making positive comments when he sees LePage on TV. LePage is currently in his second term as governor.